Anyone can slip with the foot and get injured because of difficult ground conditions! But foot skidding accidents does not only occur during winter time. Slipping accidents account for a significant proportion of all sick leave from work and related costs (rehabilitation etc). Within public areas, we can offer products such as tempered wheelchair ramps, tempered and non-slip land tiles, non-slip steps. BPAB's Conficomp-technology is safe, environmentally sound and energy optimized. To date more than 100 countries have ratified the UN Convention on the Rights of Persons with Disabilities which was adopted in 2006 and opened for signatures in 2007. The Convention declares that our society’s environment and surroundings shall be fully accessible to persons with disabilities and no one should be discriminated due to physical problems. From an accessibility point of view, the requirement of accessibility measures in society shall be adopted so that everyone has the same opportunities to move throughout the public space, without discrimination and on the same terms as everyone else. 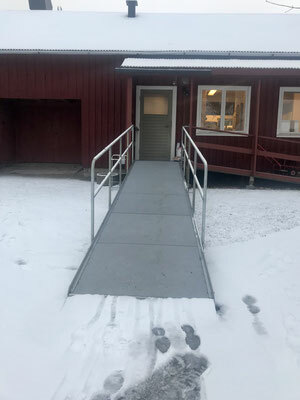 Public entrances and stairways must be adapted and safeguarded so that everyone has the same accessibility opportunities by means of flat surfaces, skid free stairways and tactile markings. 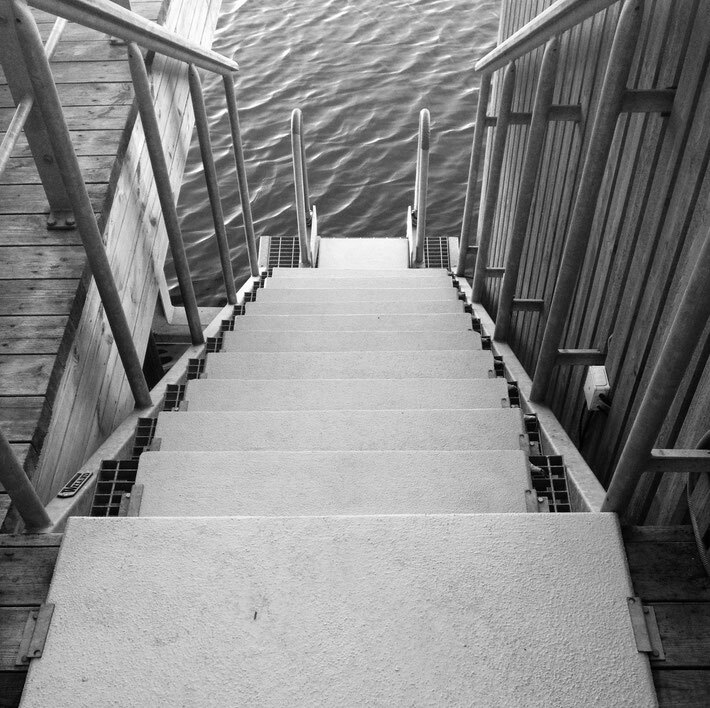 BPAB-products can be adapted as needed to keep surfaces, stairways and ramps, skid-free and ice-free all year round. Existing wheelchair-accessible-ramps can easily be equipped with BPAB's self-regulating tiles to increase availability even under very severe winter conditions. Together with our partner Evacuare, specialists in contrast markings and tactile walkways, we offer the most comprehensive solutions for safe accessibility in public places. All BPAB products can be supplied in various designs; colors, surface finishes, anti-slip grits and tactile patterns. Bus stops and stations for trains and trams can pose great risks for slipping when boarding and disembarking, and not only during winter time! But when the snow and ice settles, it may be directly precarious. 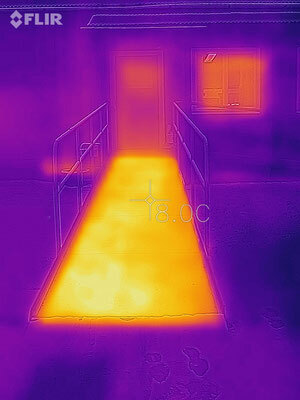 In street environments BPAB's ground tiles will neatly blend into the surrounding environment. 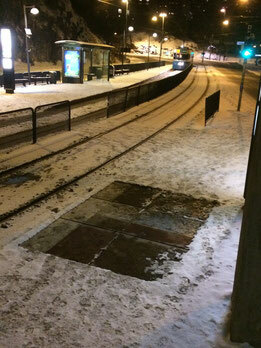 This picture shows an installation made more than a decade ago at a bus/tram stop outside the entrance to a hospital. It has since prevented numerous skidding accidents. Icicles are dangerous and roofs may collapse as a result of large amounts of snow. BPAB's technology allows property owners to sleep quietly all through the winter nights. The anti-ice system never allow ice and snow to be accumulated either on rooftops or in hanging chutes and roof gutterings. Our method is to replace some of the sheet metal and roofing tiles with durable conductive fiber composite plates that immediately melts the precipitation - when needed. The system is activated with built-in sensors which detects the outdoor temperature and activates the system automatically. BPAB will do the ice and snow clearing for real estate owners - automatically!